Katie serves ice cream cones or ice cream in a bowl. Passes through Fish Creek beginning at 5pm via the far gate (site 305), and works it's way back towards the front entrance (ie site 1). The ice cream truck leaves by 10pm. These same folks have been serving campers for years! 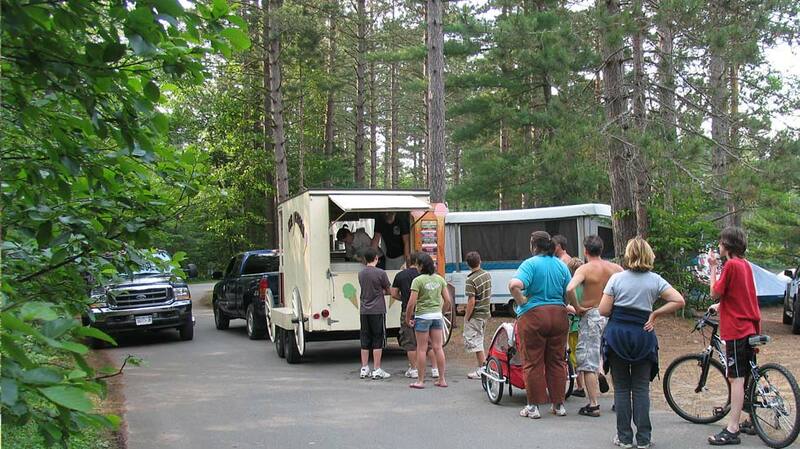 The HPT truck first started serving campers at Fish Creek in the summer of 2011. Katie serves a variety of treats including: cotton candy, popcorn, sno cones, soda water (drinks) and Bye Bye Blackfly repllent. Ice is also available. 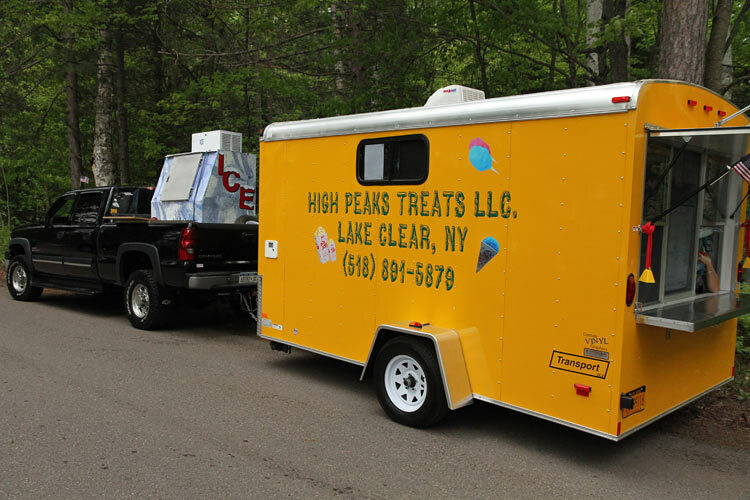 The HPT truck makes its treat cart/ice run around 12pm each day (Fish Creek only). First run for the 2013 season will be Memorial weekend, and subsequent weekends until school is out, then daily through the summer. 2015 Update! Katie will likely not be running the candy truck this year as her girls are no longer available to help. The HPT truck will be making an ice run through both Fish Creek and Rollins beginning at 8:30am. Later in the day the HPT truck will be making a wood and ice run through Fish Creek and Rollins around 4:30/5:00pm. This run will offer both wood and ice in Rollins, but only ice as it passes through Fish Creek (another vendor will be doing the wood run through Fish Creek). Wood is a standard 2cu ft rack. The HPT ice/wood truck starts Victoria Day weekend, and subsequent weekends until school is out, then daily through the summer. 2015 Update! As in the past, Katie only has a vendors license to sell wood in Rollins. If you wish to purchase wood in Fish Creek, you'll have to look for Genes wood truck or meet up with Katie up in Rollins. She sells wood (soft wood only this year) for $9. 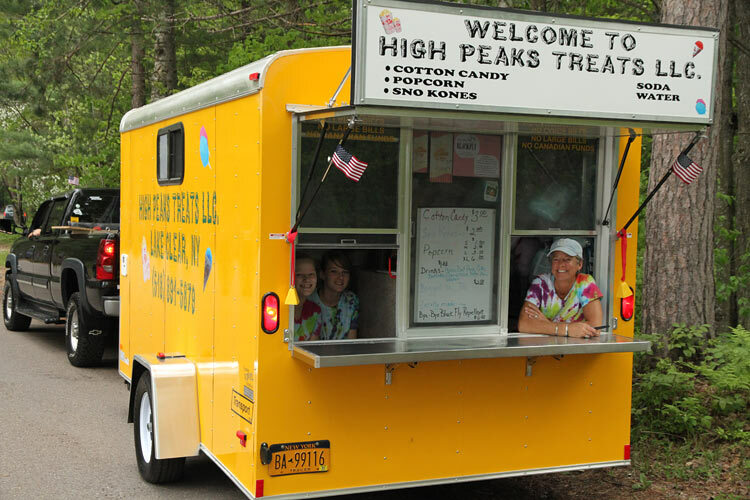 Lynne Murphy and Jemell Ellis-Branch run the High Peaks Bean & Bakery truck which passes through the campground starting at the far gate in the morning. These fine gals make the daily morning cruise around the ponds at Fish Creek serving up coffee, donuts, apple fritters, cupcakes, muffins, mini banana loafs, the Watertown Daily Times and more (see the menu photo below for all their goodies!). You can reserve newspapers (or pies etc for that matter) so you won't miss out on a paper each day. 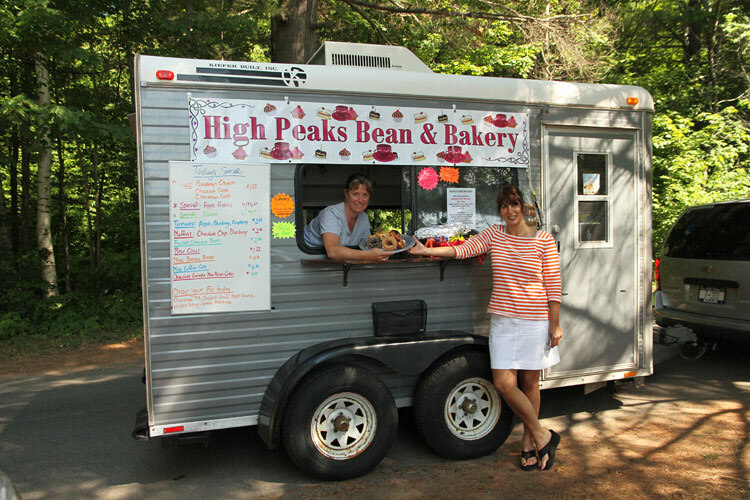 High Peaks Bean & Bakery is a new vendor as of the 2012 season. 2015 Update! Not sure if the girls have a vendors license for this season. "Hey Dave! We need a photo of this guy! Gene is the guy who sometimes gives out free flashlights when you buy a wheel barrel of wood. Nice! Gene has been serving Fish Creek for a few years now. 2015 Update! Gene sells his wood for $8 for a wheel barrel full. "Hey Dave! We need a photo of these guys! These two guys pass through Fish Creek later in the day providing a rack of nice hardwood for $7. The two guys have been serving Fish Creek for a few years now. Note (2015): Wood is also available for $9 at the front gate for a bag of kiln dried hardwood. Phil at the Trading Post sells a bundle of hardwood for $6.49 plus tax.